A former building location at 431 S 3rd Street was home to three distinctly different restaurants before its 2008 demolition: Mr. Steak, Jade Garden, and Los Amigos. The site is now home to CVS/pharmacy. Mr. Steak was a Denver-based regional chain of steakhouses. A local franchise was established in 1972 – the first entity located at 431 S 3rd Street. A second Mr. Steak opened at 1500 Interchange Avenue. Both locations closed in 1985. Jade Garden was an upscale Chinese-style restaurant that operated between 1985-1998. A large fish tank adorned the restaurant, which was partitioned into three sections, described by its owner in a Bismarck Tribune as teahouse, garden court, and dining room. Cloth napkins shaped like a peacock and hot towels only added to the restaurant’s atmosphere. Jade Garden was founded by Dale Der, who previously operated The Wok at Northbrook Mall. Los Amigos was a Mexican restaurant that first opened in or around 1993 at 1010 Boundary Road in Mandan. It relocated to 431 S 3rd Street in Bismarck, in 1998 after remodeling the former Jade Garden restaurant. 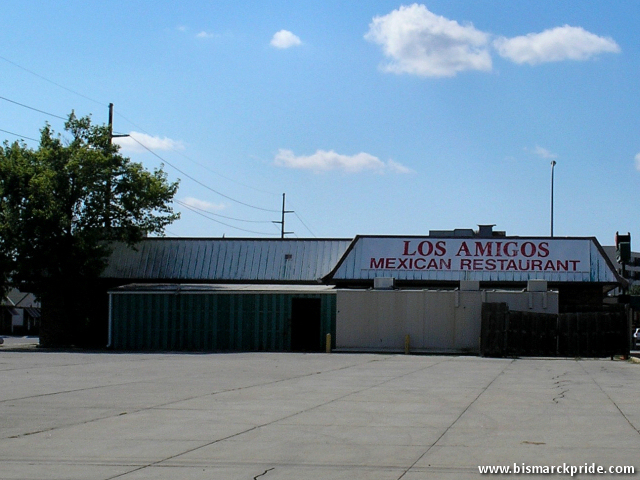 The Bismarck Los Amigos restaurant closed on August 9, 2008. During its reign, the restaurant was able to stand well against enormous competition from other Mexican restaurants like Paradiso, Fiesta Villa, and Sergio’s.